The Kings Of... series continues on its mission to bring you forgotten and neglected gems from the world of music. 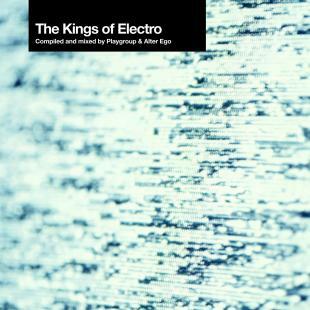 For the ninth title in this highly acclaimed series we delve into the vast, exciting world of electro. Influential DJ/designer/producer & remixer Playgroup (aka Trevor Jackson) pairs up with production/remix duo Alter Ego to bring you a selection of their top tracks across 2 CD’s. To many, Trevor Jackson (Playgroup) needs little introduction. A London based creative, he has worked in many artistic fields including graphic design, art direction, composition, remixing and production. His career began in the early 90's creating record covers for early dance and hip-hop releases for the Stereo MC’s, Jungle Brothers and Todd Terry, but he soon ventured into record production and remixing. Using the Underdog name, he became successful remixing artists such as Massive Attack, U2 and UNKLE. In 1996 Trevor formed the now legendary label Output Recordings, introducing influential artists such as Four Tet, Black Strobe, The Rapture & LCD Soundsystem as well as his own acclaimed Playgroup project. Jackson's DJ skills were showcased on the 2002 released DJ Kicks album (!K7) and his remixes for The Gossip, Common, Yello, Franz Ferdinand, The Rapture & Soft Cell have been rocking dance floors worldwide. He is currently working on the long awaited new Playgroup album due for release in late 2007. Trevor’s selection - “The History” - delves deep into his own extensive collection, digging up tracks that range from early NY classics from the Fearless Four, Hashim and Dynamix 2 via Detroit (Model 500) and Europe (Visage). It’s a classic selection and impeccably mixed. Meanwhile, Alter Ego’s side of the album - “The Present” - explores a range of contemporary styles influenced by early electro and includes releases on the hugely influential labels Underground Resistance, M_Nus, Planet E and Basic Channel. The tracklist reads like a who’s who of modern electro & techno with UR, Kenny Larkin, Robert Hood, Richie Hawtin and Maurizio all featured.